Backyard Bee Hive Blog: The Mason Bees Are Flying! The Mason Bees Are Flying! I think this bee is a female, because the antennae don't look particularly long. We started putting out our Blue Orchard Bee cocoons on March 19. I was going to put them out on the first day of Spring but it had been unseasonably warm, and I couldn't wait one more day. They should've emerged within 2-3 days, but I didn't see anybody flying then. I was beginning to think that 20F above normal was too warm. Finally after about a week, I saw bee poop! That's the first thing they do after they emerge, so that was all I needed to see to know that they were OK. In the picture, you can see the light mud-colored spots behind the green predator guard. Meanwhile we had cocoons still in the fridge, waiting for the too-warm weather to break, and I was worried that they were using up their fat reserves. 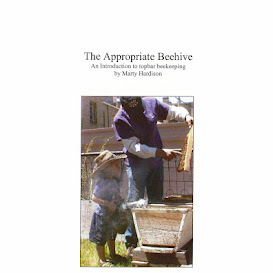 Finally on April 1, it cooled down and the remaining bees were taken out of hibernation. You can see their rolled up paper tubes through the predator guard, too. I saw several bees flying today, some visiting the pear tree and others presumable off to taste the neighborhood crabapple, peach and cherry blossoms. Even though we don't pick up our honeybees until April 21, bee keeping season has officially begun in the Backyard! * Another male emerged today, from the cocoons placed outside on the 1st. At least a dozen cocoons remain intact. Nine tubes are just about completed. * The honeybee nuc's been delayed a week, because "sometimes when Nature happens bees don't happen." * 14 tubes have been plugged. Two females have started piling provisions into the unfurling paper tubes. Whether all the bees have emerged from them is unknown. UPDATE: April 26 - no activity. 15 plugs total in the QuickLock trays. No new cocoons in the loose paper tubes. All but one of the 56 put out emerged; that cocoon was one I accidentally did not put into the fridge to hibernate. So... last year we started with 20 cocoons and ended with 56. That's a 180% gain. This year, estimating 10 cocoons per tube, we hope to harvest 150 cocoons, about the same gain. Stay tuned for one last update/post around the Autumnal equinox. If you're following me on Twitter (nudge nudge), you'll automatically get my tweet then.